Your stay on Hatteras Island would not be complete without a trip to the Gulfstream. Come aboard the Tuna Duck and Captain Dan Rooks can give you the benefit of over 15 years of fishing experience. 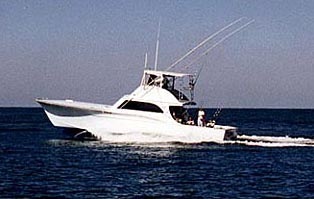 The Tuna Duck is a 51-ft. custom Carolina sportfisher and is fully equipped to provide you with a trip of a lifetime. Marlin fishing is his specialty but you may also fish for gamefish such as tuna, dolphin, wahoo and more! The Captain & his mate will provide professional & courteous service to your family and friends making your trip to the gulfstream the highlight of your vacation. If you would like to discuss your trip, call Dan at 252-995-3076 or you may book through the marina at 800-676-4939.